In my own experience waterproof/breathables are not waterproof in prolonged rain, just as Andrew Skurka and many others have said. After day of rain in Brooks Range, Alaska the other year, rain had penetrated the double layers of my eVent smock and my rain pants under the pack waistbelt. My Icebreaker merino shorts/underwear were soaked. Rain had also penetrated from my chin downwards, leaving a long and fairly wide damp trail down to my waist. This made me look like I do in this photo. 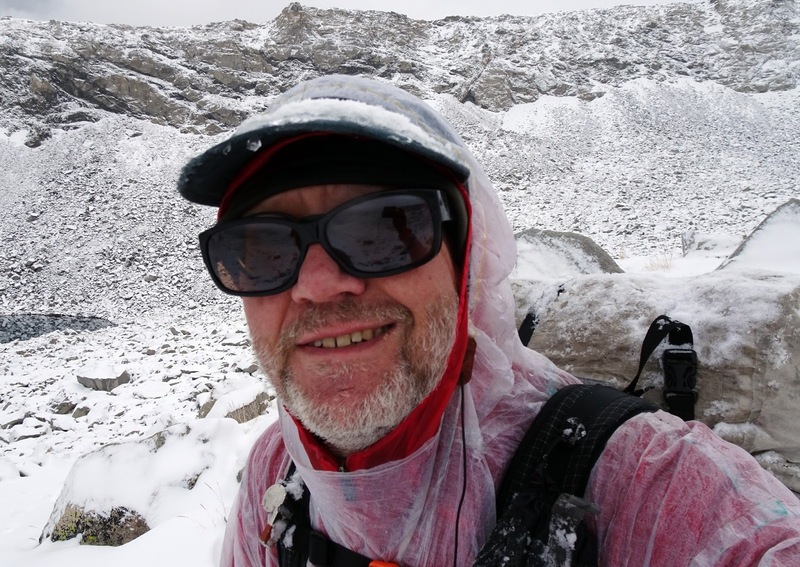 Obviously the biggest culprit was that the waist belt pressed water through double layers of one fairly sturdy rain jacket (RAB Demand eVent pullon 290 g/10 oz.) and a pair of less sturdy rain pants (Montane Minimus (150 g). 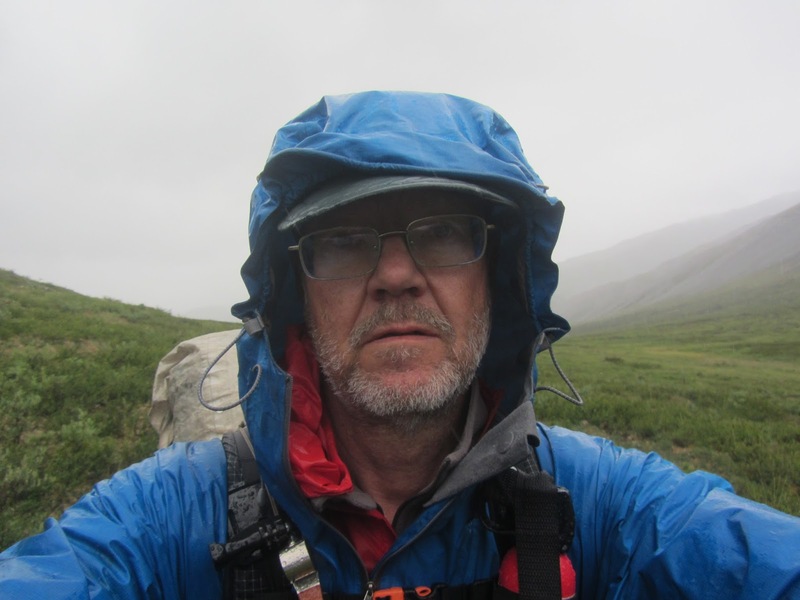 Since I knew from Andrew Skurka that his rain gear had failed in the Brooks, I had decided to get a new and slightly heavier rain jacket compared to the ones I normally used, to be on the safe side. Of course, getting the middle of your chest wet down to the waist was no fun either and I was happy that I had brought a thin fleece sweater to help my merino base layer. In situations like this, with lots of rain, fleece is great even next to the skin. Merino I find more versatile, though, so I use fleece as a middle layer that can be worn next to the skin on occassions. Back in Brooks Range 2015 with the TT Topcoat. Waterproof/breathables are not useless in any way. When it does not rain much or for long, I find them much more comfortable to hike in than non-breathable rain gear. Especially since I do most of my hiking in fairly cool climates where sweating is less of a problem. However, it is very uncomfortable and can be dangerous if they start to leak in circumstances that have been described. Especially if you are unprepared and naively believe that they are 'guaranteed to keep you dry' in all kinds of weather. I pondered different solutions to the waist belt problem. How about a wide strip of thin, but completely waterproof Cuben fiber underneath the pack belt? Maybe even increas it in size to a mini skirt? The Topcoat is worn over a light ZPacks Challenger rain jacket. However, looking at the fabric weight for the lightest Cuben and the leakage around my chest I decided to go for a very simple smock with hood, made from Cuben. This smock weighs 35 grams/1 1/4 oz and is made to be pulled on top of my waterproof/breathable rain jacket when I find that it is leaking or fear that leaking will occur shortly. I call it the TT Topcoat. It does not breath at all, so condensation will build up inside it. However, the ordinary rain jacket should be able to cope with that, and it is still preferable to getting cold rain soak you from the outside. Since this topcoat is so light I combine it with a very simple waterproof breathable jacket. I do not have to pick 'something sturdy' since I have my emergency backup. The combined weight of the two garments is still less than 200 g/7 oz. The topcoat can be used as a stand alone rain jacket for very weight conscious hikers travelling areas where rain is unlikely or not prolonged. 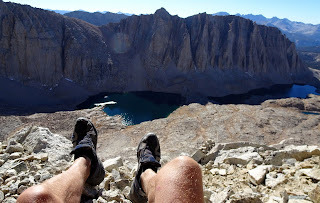 I used it this way while thruhiking the John Muir Trail in October, which was pushing it a bit. Fortunately it only snowed for a couple of hours. The Topcoat on its own, over my wind shirt on the JMT in October. 35 g for the TT smock!? If I remember correctly it was 19 g/sqm, but it could have been 17. Since there is no zip and only some drawstring around the hood, there is very little that weighs. Did you tape the seams? If so, with what? How many trips do you think you can use this before you have to make a new one? Difficult to say, of course. I used very thin Cuben. However, considering how laminated raingear often delaminates under the wear of pack shoulder straps I would expect it to last at least as long as most of the lighter waterproof breathables. And if it wears through there will be a visible hole that can be taped, which is a comparative advantage as well.